Winter is here. Now is the time for slow-roasted meat and comforting desserts to draw you back into the loving embrace of Sydney’s bistros. 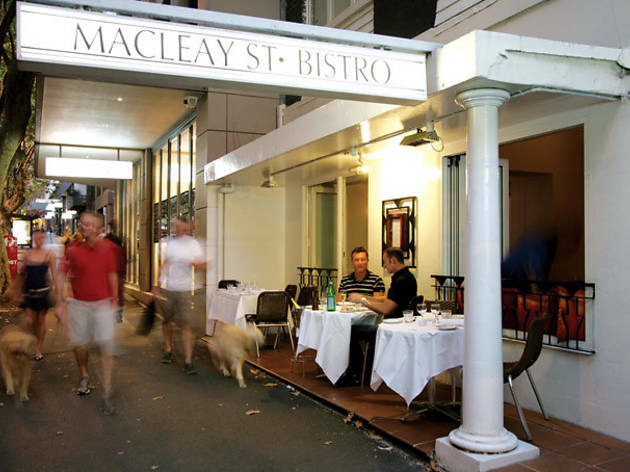 As the chill is creeping in, head for the Macleay St Bistro, one of the city’s old faithfuls. This little neighbourhood bistro has been keeping the fires burning for over 25 years, opting for consistency and reliability over trends and fads. The system appears to be working, with demand increasing enough to warrant the addition of a lunch menu Fridays through Sundays under the watchful eye of Executive Chef Ant Ewart. Though the menu changes fortnightly, expect bistro classics like coq au vin and steak Diane to make regular appearances. At $30 for two courses, they’re cheaper than their evening counterparts, too. The small, black and white bistro feels worlds away from the neon lights of the Cross, sitting at the conservative, Naval dominated end of the peninsula. Monochromatic damask prints, blood red roses and crisp white linens will suit even the most particular interior classicist, and the elegant, white fronted restaurant looks very at home amongst the Art Deco apartments of Sydney’s inner east. Start with a share plate of balsamic glazed Iranian figs with creamed gorgonzola. These cream-coloured sun-dried fruits are dense and sweet, but the balsamic tang manages to sway them to the savoury side, with help from the soft, whipped cheese. Couple them with a glass of the 2011 Lisa McGuigan pinot noir – an easy drinking red that won’t break the bank. Tender strips of calamari and fried prosciutto with soft strands of salted zucchini, whole cherry tomatoes and olive tapenade makes for a light entree, save for the tahini sauce that overwhelms the rest of the ingredients on the plate – we want more of the crisp, salty prosciutto to balance out the strong sesame flavour. The entrées flirts with a mod-Asian vibe (crab and sweet corn dumplings and a pork belly salad) but the main menu steers straight back into safe waters - familiar bistro offerings starring blocks of protein with muted performances by the accompanying winter vegetables. We say bring the veggies to the fore, don’t hide them away in braises, stews, and purees. The stuffed chicken breast is a sight for hungry eyes - golden on the outside and juicy inside, it’s carefully sliced to reveal a core of spinach and goat’s cheese, atop braised lentils, aioli and a drizzle of pan juices. It is a little under-seasoned for us and sadly the goat’s cheese doesn’t stand a chance against a dousing of pungent garlic sauce. The slow braised lamb is so tender it falls apart at the smallest provocation. Rich meat, white beans and tomato ragout is guaranteed to banish the cold from your bones. A hefty braise needs a dose of vegetables to cut the richness. For a quick fix order of side of crisp iceberg lettuce with Champagne vinaigrette to compliment all that lovely fat. Surprisingly, amongst your more typical cold-weather sweets there is a soft centred meringue topped with a zesty passionfruit sorbet and hemmed in by alternating pools of tart passionfruit sauce and cream. It’s a sharp contrast to the rest of the menu and could potentially be jarring, but actually makes for a refreshing, summery finish to the meal. Go seasonal with poached spiced quince with a buttery caramel crumble, a nutty macaroon and a big serve of Chantilly cream. 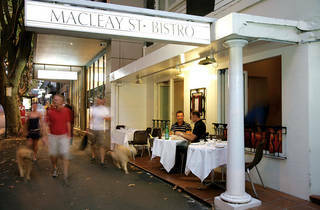 Macleay St Bistro is perfect for locals wanting a familiar midweek meal, a glass of wine and some quiet conversation. But if you’re a big fan of the genre, there are enough excellent bistros in this city that it might be worth casting your net a little wider and hitting Ad Lib Bistro in Pymble or Felix. We’re still going back for that steak Diane.